Michael May and Jason Copland discuss the massive collection of their giant monster series coming from Dark Horse, the future of the series and more. Michael May and Jason Copland have been working on Kill All Monsters! for more than a decade now, and come July they — and you — will see all their work on it collected into an omnibus from Dark Horse Comics. And in the interest of full disclosure, I should mention that I’ve been blogging with Michael in some form or fashion for about a decade now myself. So I’ve watched from ringside as KAM progressed from a webcomic to a Kickstarter project to a story in Dark Horse Presents and now to this giant-sized collection. It’s a fun story about an Earth overrun with giant monsters and the humans trying to take it back. I’m glad I’ve gotten to watch it come to life, just as I’m happy to talk with the two of them about the project’s origins and what comes next for this world they’ve created. I thought we could start by talking about the history of Kill All Monsters!. Roughly when did the two of you start talking about doing this project, and what led you to wanting to work together? Michael: Jason and I met on the message board of an old website called Comic World News. That was my first gig writing about comics and one of the other columnists was A David Lewis (The Lone and Level Sands, Some New Kind of Slaughter). David and Jason had worked on some comics together, so Jason hung out there, too. Jason had sort of a webcomic about a robot that I really liked, so we bonded over that. I remember that he ran a contest that I won, which got me a piece of art from him. Oh, and we bonded over Alpha Flight, too. We just became buds, so when he came up with the idea to do a comic with giant robots fighting giant monsters, he asked if I wanted in. And I was all over that like a Skullbot on the Eiffel Tower. Jason: I totally forgot about my RS-153 comic! One day I will get back to that old webcomic… or maybe I’ll just reuse the designs. Ha! I was just starting out in the industry and I knew very few people. Michael showed real excitement for doing a comic about robots and monsters so it seemed like a no brainer! As far as the world-building goes, what was the collaboration like between you two in the early stages –both in coming up with the idea of this world, and the character designs and visuals to go with it? Michael: We have to give a lot of credit to our pal Alex Ness for the initial world-building. Alex didn’t want to write the book, but he came up with the idea to make it a post-apocalyptic world where the monsters had taken over the planet. And he came up with some of the human factions and some details about their leaders. It was my job to come up with a story to tell in that world. The story was a collaboration, too, but with Jason this time. He had specific thoughts on the kinds of robots and monsters that he wanted to draw, so we decided to make the robots more or less humanoid and then go nuts on the monster designs. I forget how the robot designs developed specifically, but for the monsters I’d usually give Jason a very brief description and then let him run with it. The only reason I’d even give him descriptions at all was because in order to write the fights I needed some kind of idea of what the monsters were and what they could do. Jason: I wanted to make the robot designs fairly simple, in the vein of Jet Jaguar or the Shogun Warriors. Very humanoid-esque. My memory of the robot designs started with Michael supplying me with 3 names: Storkbot, Lionbot and Skullbot. I just started from there and developed some rough designs that got more refined as we crafted a 5 page pitch package to send out. 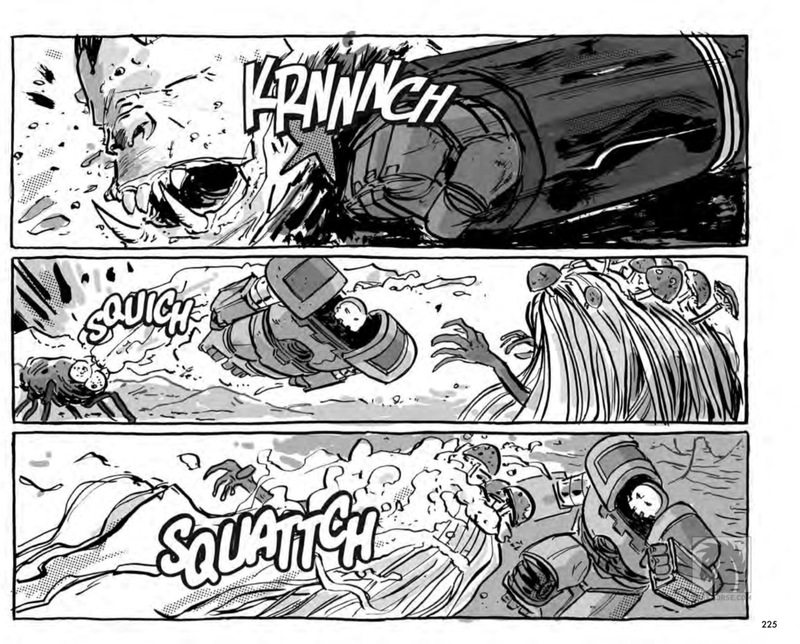 Once I had to start drawing the robots in action, I had to make edits and tweaks to make them work better visually. The monsters were designed around what Michael had them doing in the script. If one had tentacles that had to ensnare a robot, I made one have tentacles. I will say that I have tried very hard to make unique looking monsters that move away from the humanoid shape that my brain naturally defaults towards. Michael:That’s always the coolest part of seeing Jason’s pages for the first time. I never know what the monsters are going to look like. I type “plant monster” and all I know is that it isn’t going to look like any plant monster I’ve ever seen. I know Michael’s a huge giant monster fan, so I’ll ask this for him but aim it at both of you — what were some of your influences going into this project? Michael: I actually kind of learned about the kaijugenre as we made this. I was a huge King Kong fan growing up and I always liked giant animal movies like Tarantula and The Deadly Mantis, but at the time I think that the only Japanese kaiju movie I’d seen was the US version of Gojirawith Raymond Burr. It was my son, David, who really got me into the rest of the Godzilla movies. Him and also my wanting to understand the genre I was writing in. But my influences for Kill All Monsters aren’t Japanese monster movies. I thought about Star Wars a lot and what made that original movie so compelling for me. And a buddy of mine read the first collection and noticed some similarities between our world and Thundarr the Barbarian. I was a huge Thundarrfan, so I have no doubt that my subconscious was pulling from some of that as I wrote. Jason: My main influence for the robots was a Marvel Comics series from 1979-80 called Shogun Warriors. I use to read and reread those comics like nobody’s business. I remember what really struck me about the first volume (I helped kickstart it — I was backer #12!) was how cool these big robot/monster fight scenes were, but then this more dramatic/human element kind of took the story in a really interesting direction, when we first see the people of Paris. Can you talk a little bit about this element and how it came into the story? Michael: First of all, thanks for backing us! That was such an amazing experience with a lot of friends and a shocking number of strangers really coming through for us. But to answer your question, after the extended, opening fight with the main characters hidden in these suits with helmets on, it was important that we quickly got them out and interacting with each other face to face. The story kicks off because the team is on a mission to explore the rest of the world outside of where they’ve been training, so we didn’t want that exploration to be all from inside a robot. And since we wanted to keep the tone of the book fun and pulpy, we decided that the remaining citizens of Paris should be cool barbarians. We wanted to show that the world is hurting and in need of saving, but without making it super dark and depressing, if that makes sense. 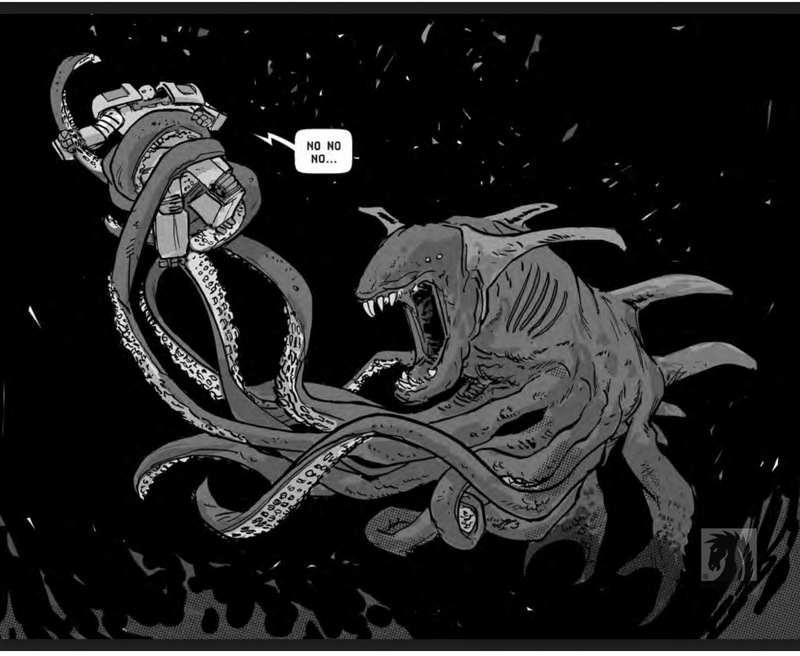 What led to the Kill All Monsters!story that appeared in Dark Horse Presents? How did you guys hook up with Dark Horse? Jason: I was tabling at C2E2 in 2013 when a guy came up and started flipping through the KAMvol1 book. He dug it and and we started talking about what other things I was working on. I mentioned that I was working up a pitch with Curt Pires called POP. He was interested and asked me to send it to him when we got it finished up. It was then that I realized that I was talking to Dave Marshall, a Dark Horse editor! Curt and I ended up working with Dave and Dark Horse with POP and then TheTomorrows. As I was finishing up myTomorrowsissue, I asked Dave if Dark Horse would be interested in doing a KAM book. He talked to Mike Richardson and got the thumbs up. Not only did they want to do a new collection but they also wanted us to work up a DHP story that would introduce the mainstream comic buyers to the KAM property! It was a thrill to not only be a part of that iconic book but also to get to draw a cover for it! That story was in color, but in the omnibus it’s in black and white, to match the first volume (I’m assuming). Did you consider going back and coloring the original story, or do you feel it works better in black and white?And what was it like, seeing the story you guys had started in B&W appear in color in DHP, thanks to Bill Crabtree? Michael: Making it black-and-white was always as much a creative decision as it was a financial one. The original giant monster movies were all in black-and-white and it just felt right and pulpier to do it that way. Plus, Jason’s grayscales are amazing. He uses all these cool Zip-A-Tone effects and stuff that he can tell you about. 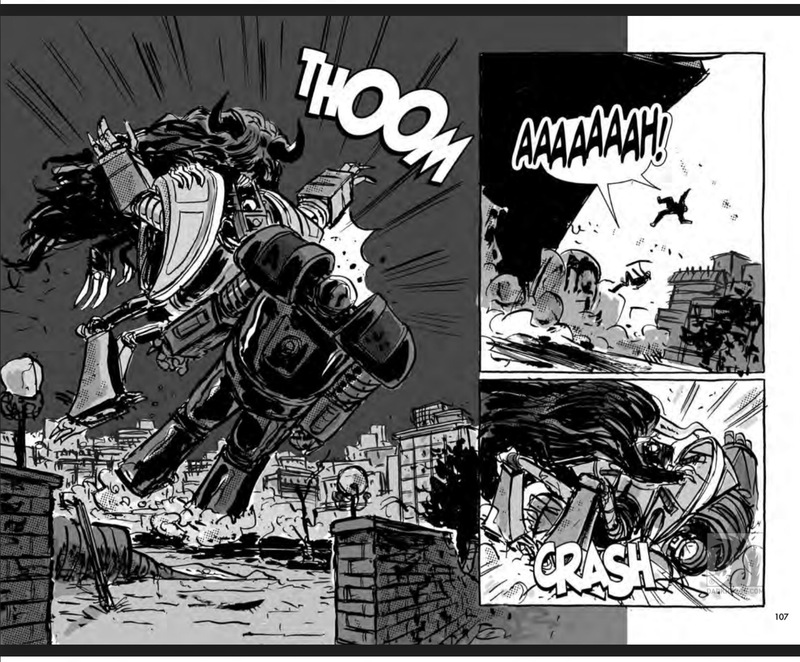 In fact, the grayscale had become such an integral part of the story’s look that I actually wasn’t sure how I was going to feel about seeing it in color. But Bill had colored Jason’s stuff before and is a great fit for him. 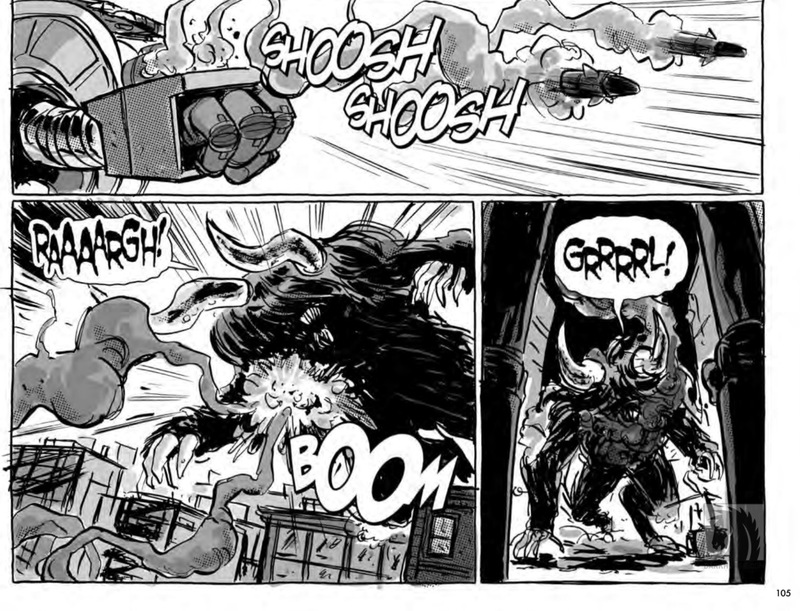 The DHP story looks amazing and part of me would love to do more Kill All Monsters in color. Jason: Yeah, for me, KAMis meant to be a gray-scaled comic. Don’t get me wrong, I was knocked out by Bill’s work on those DHP chapters but I did feel like we weren’t being true to the nature of what I think the Kill All Monsters aesthetic is. The original five-page KAM pitch we did waaaaay back when was in full color. It looked great but I felt that it was a little too… pretty, for a lack of a better word. 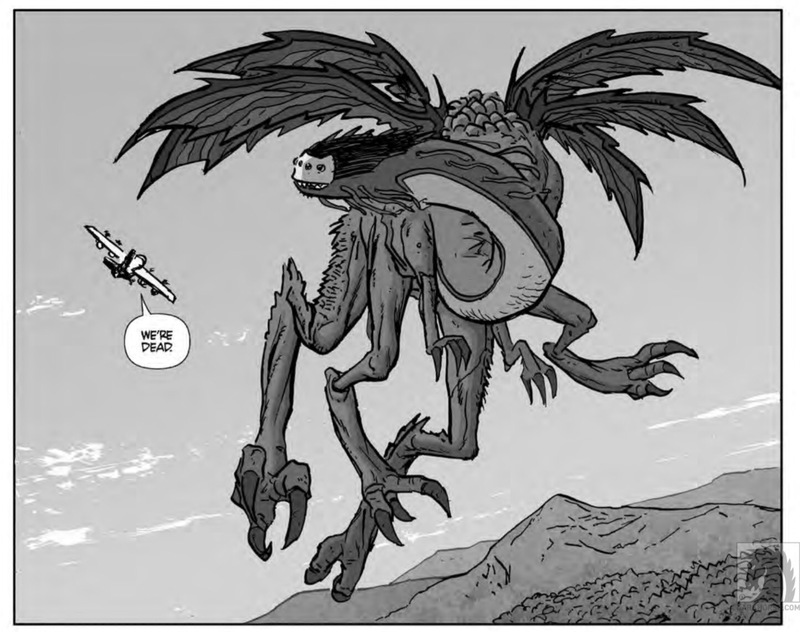 It was when we decided to do Kill All Monsters as a webcomic and I started doing it in grayscale that we realized that that was the missing visual element. The book needed to be in grayscale. You guys kickstarted the first volume of this four years ago, and Jason, I believe you have a Patreon now. What did you learn from the Kickstarter campaign, and how has crowdfunding changed the way you reach and connect with an audience? Jason: We learned that it is a lot of hard work! I fully believe in the power of crowdfunding. Michael and I never thought that the first KAM book would do as well as it did on Kickstarter. People were vocal about their interest in the book and many took up the challenge of making it such a success. It felt like we were part of a community that wanted what we had to offer. We were and continue to be humbled by the response. In the omnibus, you also have a new story — what can you tell us about it? How does it connect to the previous stories? Michael: I love the way this story came about, because Jason had drawn this poster of a Japanese giant robot and just really wanted to draw it some more. 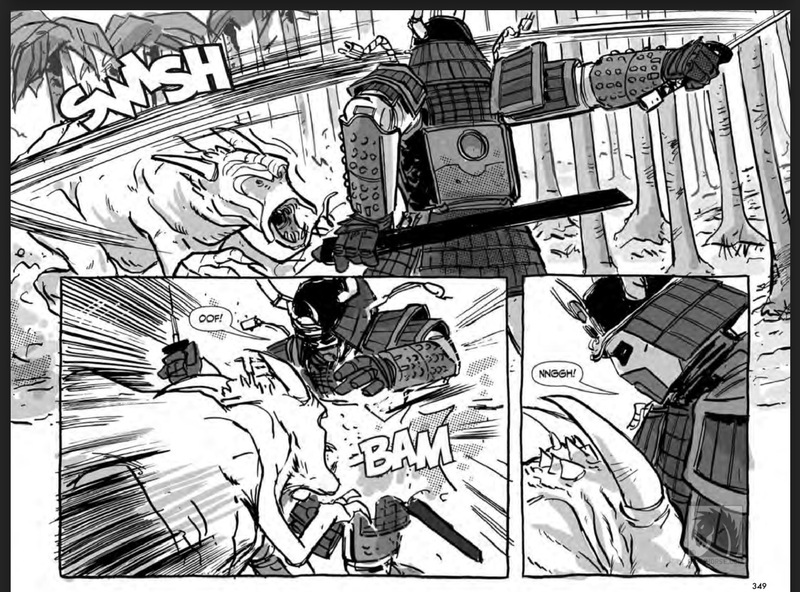 It made sense that the robot technology would start to spread to other parts of the world – as the DHP story also reveals – so we just decided to show what’s going on in Japan during the events of the main story. And happily, Dark Horse was willing to let us throw it into the Omnibus! It’s a standalone story, but it does connect to the main story in a couple of ways. We make it clear that Japan got its robot technology from the group who developed the robots in the main story. But there’s also a deep, not-so-subtle connection between the lead character in the new story and one of the characters from the main story. Jason: I LOVE drawing the new samurai robot! I begged Michael to figure out a way to get it in the book. He weaved his magic and there it is! What’s next for you guys? What other projects are you working on now that KAM has wrapped? Michael: I’m still trying to figure that out. Jason’s super busy, but I’ve been taking a deep breath and looking at my options. Now that the book is here, I need to start thinking more seriously about that. I’ve got a few projects that are still in planning stages with some different artists, but nothing that’s even ready to pitch yet, much less talk about. I’ve also been thinking about writing a prequel novel to Kill All Monsters if the omnibus does well and readers seem interested. Jason: I’m currently drawing issues 3-6 of Judge Dredd: The Blessed Earth over at IDW. Getting to draw Dredd is a dream come true for me so I’m really focused on that for the next few months. I will then be finishing up the script for a near-future crime book which I will also be drawing. It’s called FULL TILT and I will be doing a Kickstarter for it in late 2017. Finally, what does the future hold for Kill All Monsters! — is this the end, or do you have other stories in mind should the chance to tell them arise? Michael: The story in the omnibus has a definite ending, but there are still lots of stories to tell in the Kill All Monsters world. And we would love to tell them. Really it’s going to be decided by how well the omnibus does. Dark Horse and Jason and I are all interested in doing more if there’s an audience for it. Jason: I certainly hope it is not the end of Kill All Monsters! I want to draw these characters for years to come.